Oh dear…the first hive (Hive 1) has really suffered. The bee numbers continued to deplete and eventually the hive died out. It is quite possible that by adding a second super in Autumn we, in our ignorance, doomed the hive to work too hard to keep warm over winter and not then be weak and vulnerable (there was some wax moth in the hive). What is interesting though is that at the same time as hive 1 was dying, we had a swarm of bees at the back of the house. In fact quite a few got inside! We have no idea if this is the queen and bees from hive 1 who left an ailing hive, or if it is unrelated, but we decided to capture it. What an experience that was! 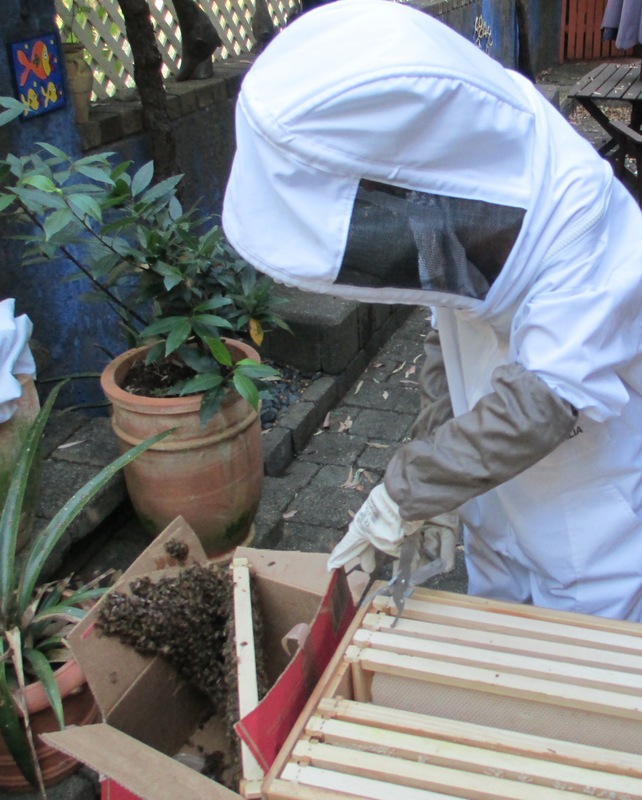 The bees were very docile, and willingly made a home in a cardboard box that we had put a drawn comb frame in plus a bit of honey. 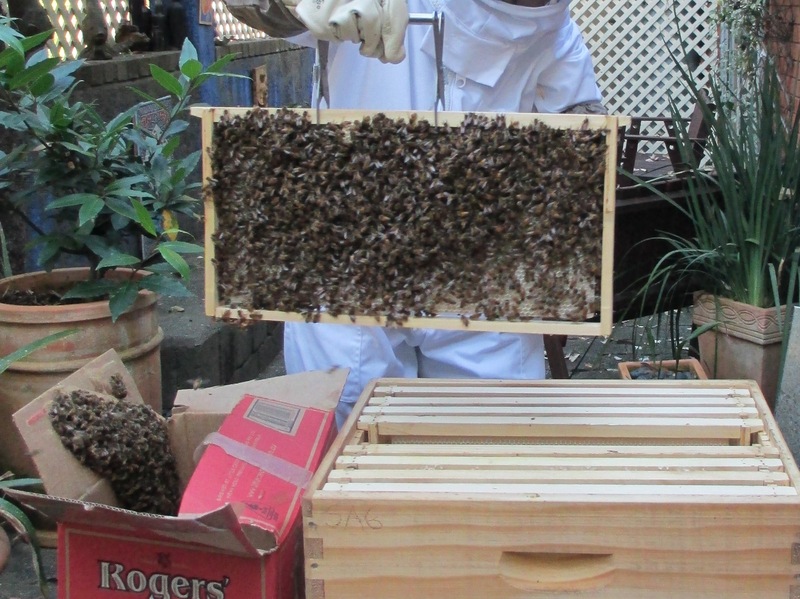 After a day and night of them coming and going into the box, we lifted the box with sleepy bees at night and placed it into a hive box. After another day or so of getting used to this and a different position, we did the final change over- lifting the frame covered in bees and placing it into the hive box with other frames already in place. opening a box full of buzzing bees! It was amazing! 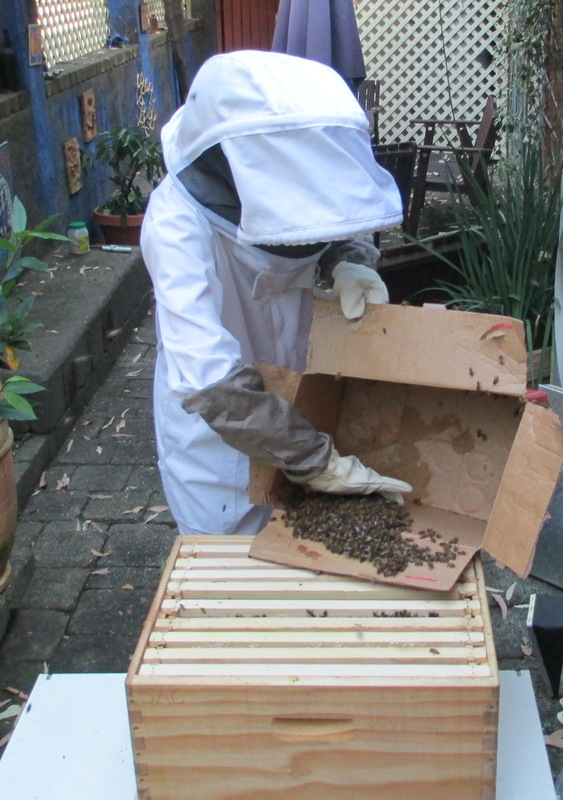 The bees moved quite happily, and soon got used to coming and going from the hive box. We later added a bottom board and proper lid, and they soon realised the entry was now at the bottom of the box and not the top. Today we moved the box on a slightly different angle, and will continue to move it a bit at a time to where we want the final position to be.